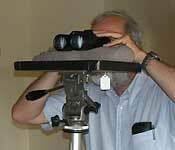 We evaluated 56 mid-priced binoculars for Bird Watcher's Digest in the summer of 2007. Even if two binoculars have the same magnification and objective lens size, one may provide a much wider field of view than the other. It's all in the design of the eyepiece. And you have to look at the field of view in the specs, because you cannot deduce it from the other numbers. Field of view and eye relief are rivals. When a binocular designer increases one, the other one suffers. Only by adding expensive elements to the eyepieces is it possible to maximize both at once. That is probably why we did found only a few mid-priced binoculars that had both outstanding eye field of view and outstanding and eye relief. However, for a person who does not wear glasses, eye relief doesn't matter, and a binocular with a wide field of view can be enjoyed without penalty. We found several binoculars with exceptionally wide fields of view and moderate eye relief that might work well for some, though probably not for all, glasses wearers. Among these were three 8x32s — the Kowa BD32-8x, the Minox BL, and the Carson Optical SM-832HD, each with an over 420 feet field of view at 1000 yards. Among the 8x42s, the Vortex Razor turned in the widest field of view by far — 410 feet at 1000 yards, and yet it provides 18mm of eye relief, adequate for virtually any glasses wearer. The Leupold Katmai 6x32 also achieves both a wide field of view (425 ft.) and long eye relief (19.2mm). Three 10x42s in our study offered fields of view over 340 feet at 1000 yards, and these all have eye relief of at least 16mm, which is adequate for most glasses wearers. These were the Kowa BD42-10x High Performance, the Minox BL, and the Bushnell Elite2. This article appears as part of the Midpriced Binoculars Round Up in the November, 2007, issue of Bird Watcher's Digest. Text and photos copyright 2007 by Michael and Diane Porter. Generally, the better the binocular, the more it costs. But there are good values in every price range. Here are Michael and Diane Porter's picks for the best binoculars at each price. Binoculars measure field of view as how many feet wide is the image at 1000 yards. Among 10x42 binoculars, the widest field of view is usually found in the most costly binoculars. The Zeiss Victory FL 10x42 has a field of view of 330 feet at 1000 yards, as does the Leica Ultravid 10x42. The Swarovski EL is another superb 10x42 binocular with a 330 foot field of view. If you're in the market for a top 10-power binocular and you care about field of view, you might start with these three.